Every type of roof structure presents its own unique challenges in new construction for companies who supply and install permanent equipment on them. With structural steel its reinforcing, with concrete it can be missing a pour. Hollow core precast can be looked at as one of the most challenging roof construction types for the installation of window washing, suspended maintenance and fall protection systems. The main issue with precast lies with the fact that there usually is no drop ceiling underneath. 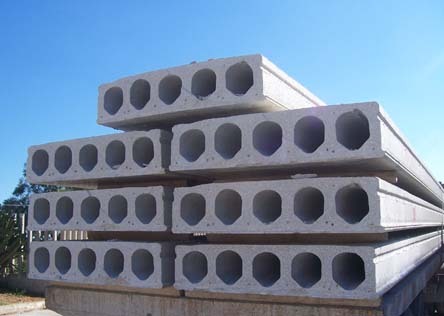 It is quite often stucco and even plaster which means bolting through the structure would require leaving a backplate exposed to view at the underside of the precast. Not only is this not aesthetically pleasing, it also presents a potential danger to the workers who use the roof anchors as the base securement of the anchors is exposed and could potentially be tampered with. This provides us with two options: cracking open the cores and grouting the anchor in or having the precast manufacturer embed plates. This option requires two cores to be broken open and embed plates at bottom of the bolts to be cast in with rebar and grouting. This prevents from having to bolt through the structure but is very labour intensive and thus costly. Ideally in new construction the roof anchor company would supply only this anchor and leave it up to the general contractor to break open the cores and grout the anchor in. Grouting in hollow core is quite common. This option although the most cost effective when you cannot bolt through, is unfortunately very impractical and rarely used. An embed plate is sent to the precast manufacturer along with an engineered stamped layout showing the location of the roof anchors on the roof plan. The precast manufacturer then embeds this plate in to the hollow core structure at the appropriate locations. The roof anchor manufacturer goes to the site afterwards and welds the pier and U-bar in place. The problem with this approach is that the precast manufacturer will usually not want to take responsibility for casting the embeds in. At the end of the day bolting through is the best way to go but when you cannot here are a few options for you to consider.